The wood and service that we receive from Lou Irion and Myron Yoder has made our lives, our furniture, and the lives of our patrons better. In 2004 , we were featured on the cover of Woodshop News. I got a call from Lou Irion, of Irion Lumber. He said, "I've never made a cold call before." He went on to say he had read of us in the magazine and would like to provide us with walnut lumber for we seemed a fit. I liked what he said very much, but I had just made a deal for walnut from a local hardwood yard whose manager and staff had supported us in many ways. I told Lou I'd better follow through. A couple of years later, the local yard sold and the staff dispersed. I wondered, "Who was it that called?" 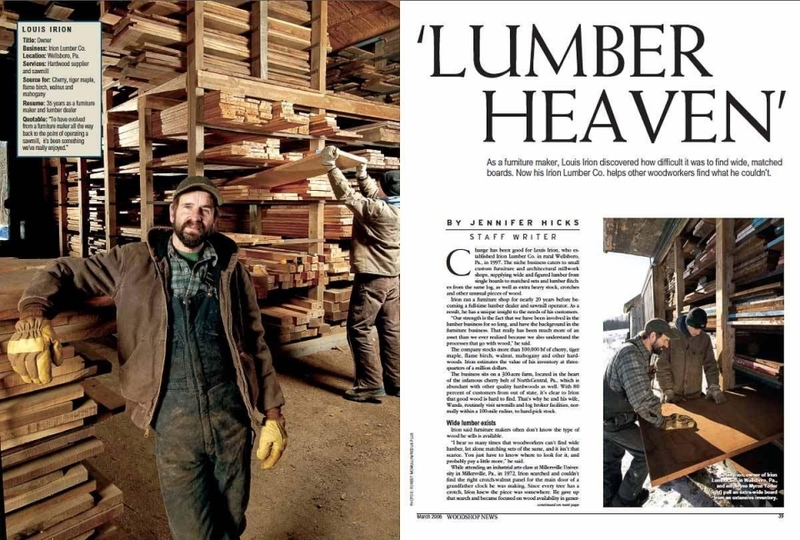 Lou and Irion Lumber were on the cover of the next issue of the Woodshop News. Since 2006, we have bought walnut lumber, selected to our specification, occasional extraordinary wood for special editions, and table sets of walnut, cherry, and mahogany from Irion Lumber. We could not have been better served. We could not be more grateful, or loyal. The Irion Lumber Company is a small specialty hardwood lumber business located in Wellsboro in the heart of the timber country of northcentral Pennsylvania. We carry a large inventory of a few select species in thicknesses from 4/4 to 24/4. We are currently stocking plain and figured Pennsylvania cherry, tiger maple, unsteamed eastern black walnut, mahogany and butternut, with intermittent supplies of curly birch. Our background in making period furniture to order, where the quality of the wood was an extremely important part of the process. We have structured our business to supply the finest hardwoods we can procure, with an emphasis on wide and matching lumber from the same log, as well as the supporting random width and length lumber of similar quality. Our target customer is the small custom furniture shop or architectural millwork shop, as well as the serious amateur woodworker, where the quality of the lumber is essential to the success of their project. Leslie and I visited Irion Woodworks. The welcome was sterling. The care, skill, and integrity manifest.